The latter part of 2016 was super hectic for me because there were so many things going on in my life. And because of the holidays and a number of out-of-town trips, I had zero time to go online to write blog posts. ...but better late than never, right? 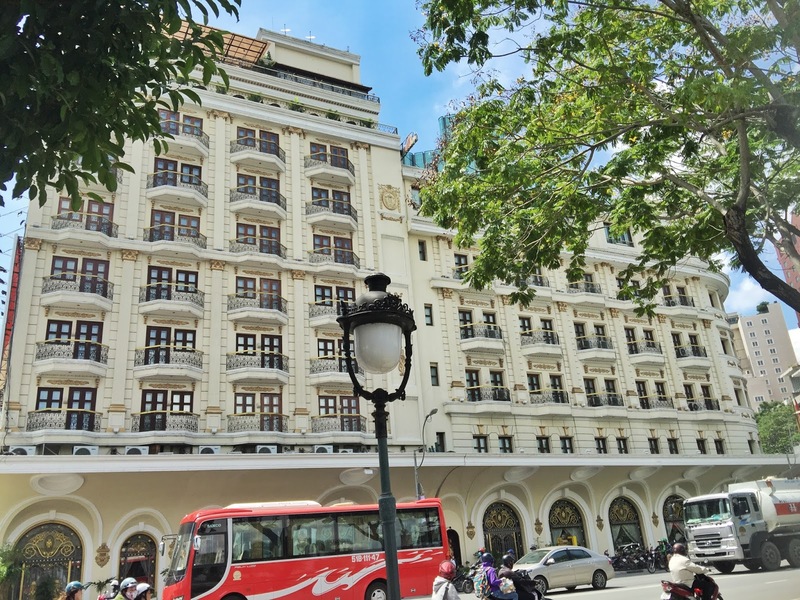 In this post, I'll be sharing photos of my trip to Ho Chi Minh last October! It was my first time in Vietnam so everything was new to me. Read on to know what happened on my first day! We did some sightseeing on our first day. All the popular tourist spots in the city are within walking distance of each other. In fact, there's no need to join a group tour, you can do it by yourself with just a map! The photo above shows the picturesque Saigon Notre Dame Cathedral. Spotted some beautiful buildings while walking around the city! At one point, we got pretty exhausted because of the heat and decided to stop and rest for a bit. We spotted a cafe called Katinat just along the sidewalk and I ordered a cup of iced white Vietnamese coffee. Yum! We had late lunch at this artsy cafe called Propaganda which was right across a huge park in the middle of the city. My first taste of Vietnamese dishes in Ho Chi Minh! After lunch, we headed to our last stop, the War Remnants Memorial. We were in a hurry because we signed up for a street food tour which would start at 6pm. We were picked up from our hotel and were taken to various food stalls in a certain district in Ho Chi Minh (if I remember it correctly, it was District 4). It was pretty great to try Vietnamese specialties in the places locals frequent rather than to try them at popular tourist destinations. Among all the dishes I tried in Ho Chi Minh, my favorite is the fresh spring roll. I'm not fond of eating vegetables but this dish captured my heart (and my tummy) since day one! After sampling so many dishes (and drinks! ), we were extremely full but we couldn't say no to dessert! The green squares pictured below reminded me of Japan's mochi. Last but not the least, the lotus seed soup. The soup had a very light taste with just a hint of sweetness. Sadly, I found a piece of hair on my bowl so I took only a few spoonfuls just to try it. In total, I think we sampled around seven or eight dishes from various food stalls. Before we said our goodbyes, the tour coordinators gave us one banh mi each for us to take home. If you're planning on joining a food tour in Ho Chi Minh, I highly suggest Saigon Street Eats. The coordinators are super friendly and I learned loads of stuff about Vietnamese culture because of them! Looks like you had a great time! I love to get a shot of that tank statue! Too bad you were in a hurry then. You could have a lot of fun looking around. I have been to Ho Chi Mihn City and I have been to most of these places, except the cafe (since I do not drink coffee). There are some pretty depressing memorials about the war there. I was able to go to Ho Chi Minh twice and was able to see the cathedral and the war museum. They are really so rich in terms of architecture and history. Such a beautiful place to live in! The place is so clean! And the food looks delicious!